Obama: Country Needs To Do Some 'Soul Searching' On Gun Control : The Two-Way President Obama addressed the issue of gun control hours after another school shooting left two dead. He said Washington should be "ashamed" of its inability to pass gun control legislation. 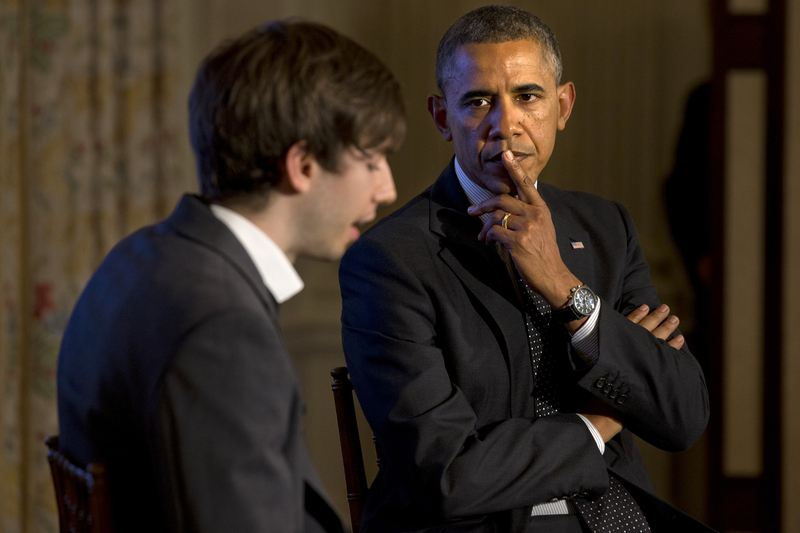 President Obama listens to a question read by Tumblr founder and CEO David Karp during a Tumblr forum Tuesday. Just hours after another school shooting left two dead and one injured, President Obama was asked what he's going to do about these kinds of incidents. "The country has to do some soul searching about this," Obama said. "This is becoming the norm, and we take it for granted in ways that, as a parent, are terrifying to me." Obama went on for about seven minutes. He was talking during an education-focused question-and-answer session with David Karp, the founder of the microblogging site Tumblr. He said the core of the issue is not mental health, but ready access to guns and large caches of ammunition. He said Washington should be "ashamed" of its inability to pass gun control legislation. President Obama tried to pass gun control legislation after the shootings at Newtown, which left 20 children and 6 adults dead. He made it a central part of his 2013 State of the Union address. But, ultimately, even a watered-down version of the initial bill failed to become law. As our friend at It's All Politics Frank James put it, the failure was a "stinging blow" to Obama's second-term agenda.